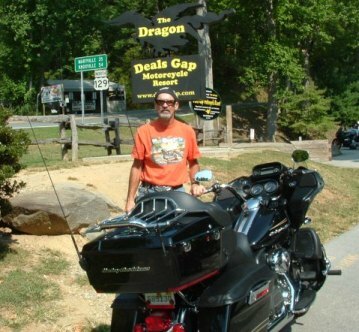 Future Rides: Planning to ride the Outer Banks of North Carolina in the Summer of 2013. Interesting Facts: I get better gas mileage with my wife riding with me than I do on my own, go figure that one out! I went to the Fl. State HOG rally in Oct. Leesburg, Tavares, Clermont, the riding thru the rolling hills, by the lakes, and through the orange groves, off the hook! If you haven’t rode any in those areas your missing some great rides. Watch the speed trap in Carrabelle, Fl. it’s expensive! On our 1000 mile trek we actually saw a woman in a brand new Jeep drive off with the fuel Pump nozzle still in the tank and gas pouring out everywhere where the hose disconnect separated. Needless to say no gas here! And finally if 2 wheels truly doesn’t move your soul, you’re probably dead.